When asked to make a salmon birthday cake by a family of avid sports fisherpeople, I was excited but slightly nervous about the challenge. Wanting to be as anatomically accurate as possible, a great deal of time was spent researching the five different species native to the waters of British Columbia. Which species should I make? Ocean or spawning form? Male or female? Having more silver edible metallic colouring than red on hand, I chose the ocean form of coho and began construction of this lemon flavoured salmon birthday cake merely using one single well-loved 9" x 5" x 2.5" loaf pan. My coho ended up measuring 24" from nose to tail, although the actual cake only started at its gills. 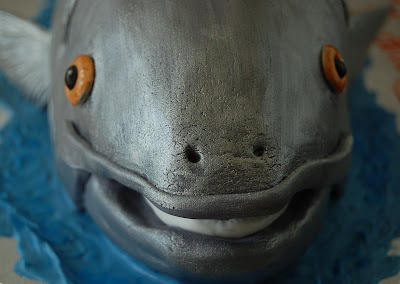 After several unsatisfactory attempts to shape the coho's head out of fondant, I gave up and opted for styrofoam instead. As always, the most enjoyable part of creating this coho salmon cake was the little details. Each scale was marked by using a small round piping tip. Its mouth was given white gums and a black tongue along with some teeth, staying true to the coho species. Finally, I did take the liberty of giving my coho more of smile than found in nature because this was a birthday cake! 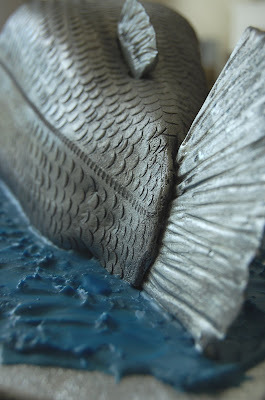 Posted by Charmaine at 8:50 a.m.
so realistic... love the metallic effect! May 30, 2008 at 8:13 a.m.
That is amazing Charmaine! I love your eye for detail. Our fishy birthday cake for Kevin quite pales in comparison, but we are merely a loving Mommy and Daddy. June 3, 2008 at 1:07 p.m. Thanks Aran! Thanks Judy! 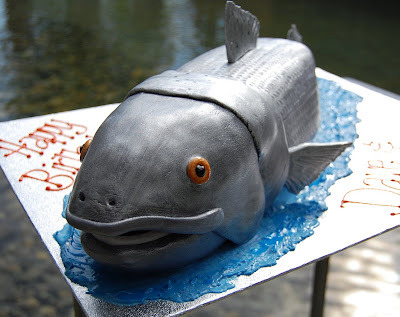 I'm sure Kevin's fishy cake was perfect for him. He would have been scared of this coho! June 3, 2008 at 6:42 p.m.